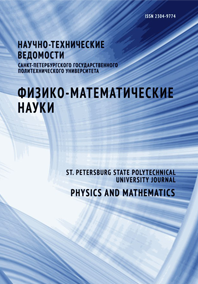 Gataulin Yakov A. Zaytsev Dmitry K. Smirnov Evgeny M. Yuhnev Andrey D.
Numerical study of the secondary flow in the two geometrically different models of a common carotid artery has been carried out. One of the models (Model 1) is characterized by a statistically averaged curvature, and the second one (Model 2) is attributed to the maximal curvature of the artery. It was shown that the most intensive swirl occurred at the phase of flow rate decreasing, the maximum values of the swirl parameters were observed at the interface of the cervical and thoracic segments of the artery. This interface is the place where the Dean vortices are transformed into a single vortex forming a swirling flow. The swirl intensity averaged over the systole and characterized by the ratio of the maximal values of the axial and circumferential velocities was evaluated as 0.20 for Model 1 and 0.25 for Model 2. Generally, it was in accordance with the data of clinical measurements.